Sail away from the crowds to experience the true tranquillity of the Andaman Sea. ... and cruising around the hundreds of idyllic palm fringed beaches and uninhabited islands, at your own pace (or the winds). Find a secluded spot that you like and drop anchor at one of the many sheltered anchorages. Jump into the crystal waters whenever you feel like taking a dip, or stop off at an island of your choice to walk on empty, picture post card beaches. The Andaman Sea is famous for its limestone stacks that protrude vertically out of the water to staggering heights. While sailing the Andaman you will see one stunning panoramic view after another, and what's more, you will feel as though you have it all to yourself. ... Dive into in marine rich waters, enjoy romantic honeymoon sunsets, learn to sail, or simply unwind as the wind takes you from island to island. We can arrange special wedding or honeymoon packages, and can even supply a personal videographer to film your trip so you can relive your memories for years to come. Please browse through our suggested itineraries and activities for more ideas, or contact us to create your own dream trip. ... Sail from Phuket to the Similans, Surins and the ever stunning Phang Nga Bay, visit Koh Phiphi's beaches, Koh Haa's coral reefs, Koh Rok's romantic anchorage from Krabi or Koh Lanta or discover the pristine islands Koh Adang, Koh Butang and Tarutao with a yacht starting from Langkawi. It's only up to you, your time and your interests. All of our onboard staff are good fun, discreet, friendly, and polite. They will do everything possible to ensure your trip runs like a dream. For additional safety and peace of mind, we operate in full compliance to Coast Guard Safety Regulations and provide full insurance for all charters. 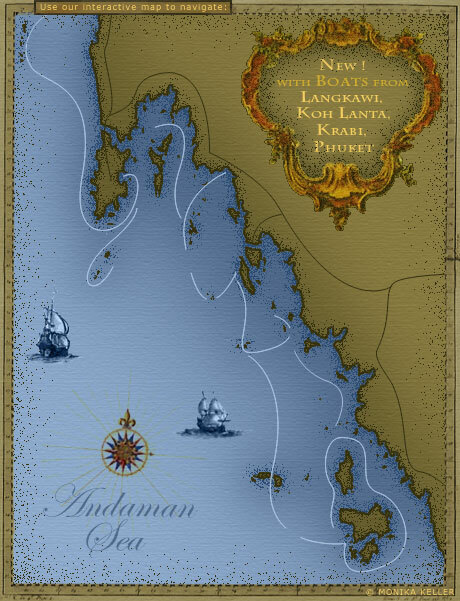 Lanta Sailing has expanded it's sailing area towards the Burmese border in the north and the Malaysian island of Langkawi in the deep south! We now represent a wide range of monohull-yachts, catamarans, superior yachts as well as power boats and motored yachts that together cover the entire coastline of Thailand's Andaman Sea. Whether you choose a comfortable crewed yacht charter or skipper on your own with a bare boat charter, we offer starting and dropping points from Phuket, Krabi, Koh Lanta and Langkawi. Make your tailor made cruise to a dream holiday with just the right mix of secluded anchorages, underwater exploration, island discovery, high standard marinas and fun time on board. Only a one day sail from Phuket to the north, the archipelago of the Similan Islands emerge from the clear waters. The white sandy beaches fringed with the typical huge rock boulders can be discovered by kayak and the world famous coral reefs invite for snorkelling and world famous scuba diving. The buzzing peninsula is home base to many of our represented yachts. Phuket offers every standard of accommodation, an international airport, two marinas and is center of the yearly King's Cup Regatta. It is the gate way to the stunning landscapes of Phang Nga Bay and as well as the northern west coast. Sail around a multitude of uninhabited islets and enjoy the unique scenery of Phang Nga Bay, Phuket's primary destination when it comes to sailing. "James Bond Island", the Pak Bia group, the hidden lagoon of Koh Hong and the secret beach of Koh Dam are only a few of many more highlights here. A sail of a couple of days through the stunning landscape of this extended bay can be a great cross over trip to Krabi (Railey Beach and Ao Nang Bay). Visit the "room lagoon" and the charming beaches of Koh Hong. Sail around Pak Bia group of islands. Swim, relax and enjoy the picturesque scenery. Secluded anchorages, idyllic palm fringed beaches, and uninhabited islands are plentiful in the Southern Andaman Sea. Admire hidden lagoons, pristine coral reefs, and one breathtaking view after another. Visit stunning bays and "The Beach". Sail along the impressive walls of Phi Phi Leh. Snorkel, swim, and relax. We can organise rendezvous scuba diving at Phi Phi or the Bida Islands. Koh Lanta is a beautiful laid-back island that is perfectly positioned for exploring the paradise islands of the Southern Andaman Sea. Cruises can go to Phuket, Krabi, Phiphi or Langkawi from here. It is home to sweeping beaches that face the sunset, a wide range of accommodation and a variety of activities. Enjoy diverse marine life, or sail around the primitive looking pinnacles. Swim, snorkel, relax, and enjoy the sunset at this picturesque anchorage. We can organise rendezvous scuba diving at Koh Haa. Sail further south to the pristine islands of Koh Rok. Enjoy the uninhabited white beaches and watch the monitor lizards. Relax, enjoy and snorkel the extended coral reefs. We organise honeymoon overnight stays at this romantic anchorage. Sail around the uninhabited islands of Thailand's southern most national park. Enjoy unspoilt beaches, undisturbed wildlife, and pristine coral beaches. Visit one of Koh Lipe's cozy beach bars to touch base with "civilisation". Koh Tarutao has a distant history as pirate's nest, later penal colony from World War Two of which remains can still be found. In the north a river can be navigated upstream by dinghy deep into the mangrove forest. You will find several hiking trails, a chance to bathe under a waterfall, a number of excellent anchorages, one small restaurant at the national parks station. Over a hundred islands offers great sailing and plenty of protected anchorages, so the area has become an established sailing destination with events like the annual Langkawi Regatta, attracting boats from all over the world. Langkawi now has four marinas and some of them are part of resort developments offering all the amenities of first class resort hotels in addition to yacht services. 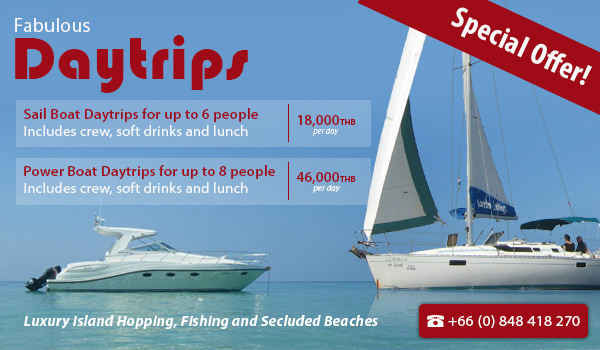 with Boats from Koh Lanta, Krabi, Phuket and Langkawi.